 Fine tips for delicate work. 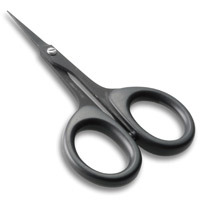  Note: The tips on these scissors are very fine, care needs to be taken not to drop the scissors or the tips will bend or break.  Tungsten carbide blades offer greater durability and prolonged sharpness. 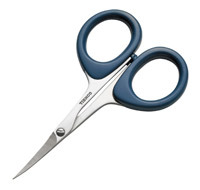  Serrated blades are very effective for cutting problematic materials. Sharp, precision made, well balanced and comfortable in your hand. Large plastic handles, stainless or black finish. 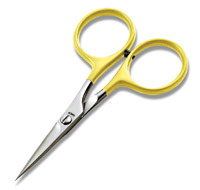 The ultimate fly dressers scissors that stay sharp longer. 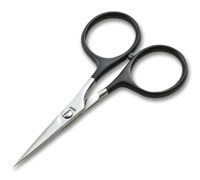 Premium quality fly dressing scissors. 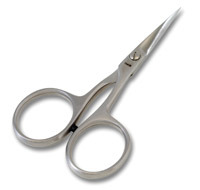  Stays razor sharp longer than any other scissor.  Curved blades useful for cutting muddler heads and for dressing bass bugs.  Fine blades for delicate work on small flies.  Unique fluoride finish to blades that prevents glue and varnish sticking.  Unique design prevents the varnish from drying out. This fly tying brush is specifically designed fly tying brush.  Hard durable stainless steel brush.  Great for roughing up dubbed bodies. 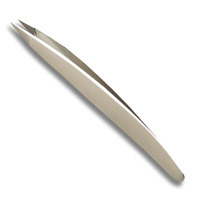 High quality tweezers specifically designed for fly tying.  Fine tapered tips for grasping the finest of materials.  Textured internal tips for extra grip. 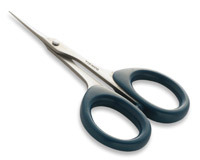 Hackle pliers with a soft silicone rubber grip. 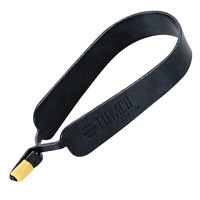  Designed to grip the feather tip firmly without breaking the delicate stem or hackle fibre.  Standard size for dressing size 14 flies and smaller. 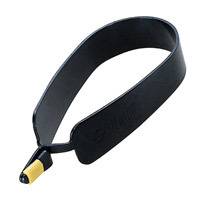 Hackle pliers with a soft silicone tip grip.  Standard size for dressing size 14 flies and bigger. A high quality multi use tying needle. 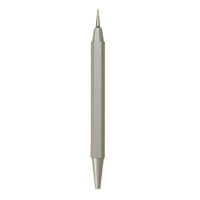  Features a steep tapered needle that will not bend.  Half hitch tool on rear of handle.  Great for applying varnish and for picking out dubbing. 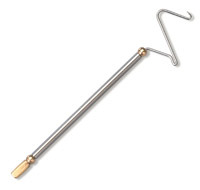 A compact whip finish tool perfect for finishing small flies. 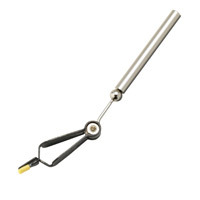  Roughly half the size of a standard whip finish tool.  Gives more accuracy and control when finishing small flies.  Perfect for finishing flies size 16 or smaller. Simple and quick to use. 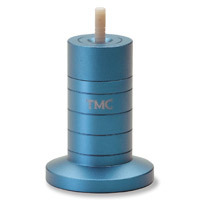 Insert the TMC bobbin threader through the bobbin tube, turn slowly to catch the thread with the hook of the threader, and pull out. 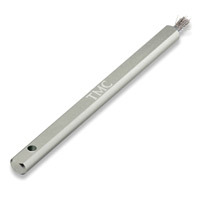 These small, soft tipped hackle piers have a silicone ring for increased control while wrapping hackles. Aids in precise tension and positioning of all hackle sizes. Straight. Bobbins with ceramic tubes ensure years of smooth fly tying. They will last many times longer than conventional steel bobbins. With this tool, the hackle is always aligned in the right direction and at right-angles to the hook shank. There is no need to change hands to undo twists you get when using conventional hackle pliers. Perfect flies every time. A short stemmed version of the Spinning Hackle Plier.  Short stem for more detailed work on smaller flies.  Rotating head prevents hackle twist when winding.